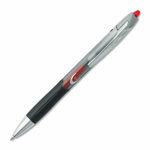 Triumph 537RT Gel Pen offers a metallic barrel wrap and beveled silver clip for a professional look. Rubber grip on this retractable pen is designed for comfort and controlled writing. Refillable gel cartridge delivers smooth, acid-free ink. Secure gel ink helps keep documents safe. Ink is fade-resistant and water-resistant.